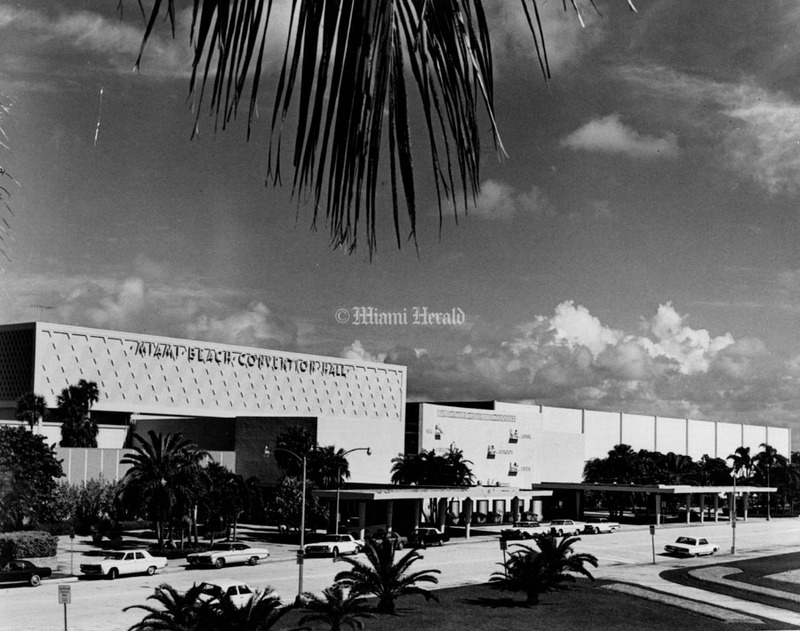 Built in 1957 to draw more business to Miami Beach, the convention center has served as the backdrop for some major moments in South Florida history, from political conventions and Miss Universe beauty pageants to a Billy Graham religious crusade and the 1964 fight between Cassius Clay (before he became Muhammad Ali) and Sonny Liston for the nothing less than the heavyweight championship of the world. Political conventions from both sides of the aisle were held at the convention center: the 1968 Republican National Convention, and, in 1972, both the Republican and Democratic National conventions. 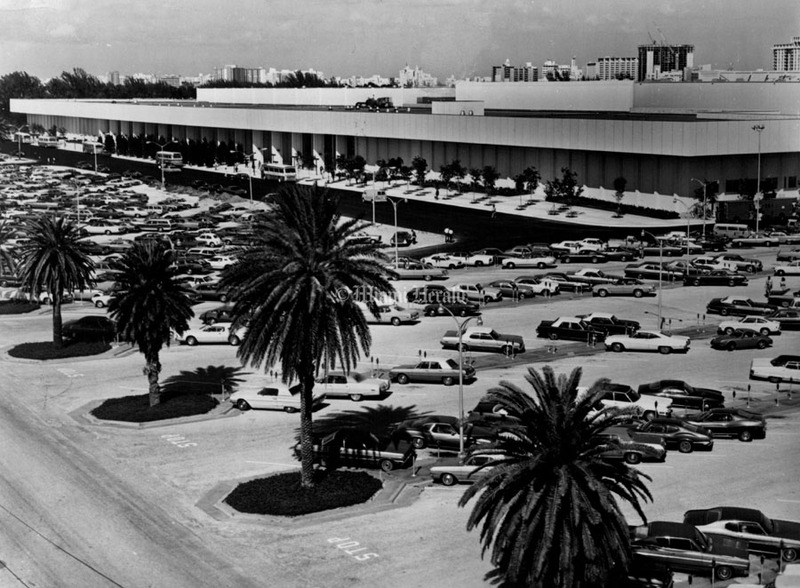 Though its boxy façade has lost some of its luster and plans to redevelop it have been considered for years, the center continues to draw well-heeled international visitors in droves for events such as Art Basel and the Miami International Boat Show. 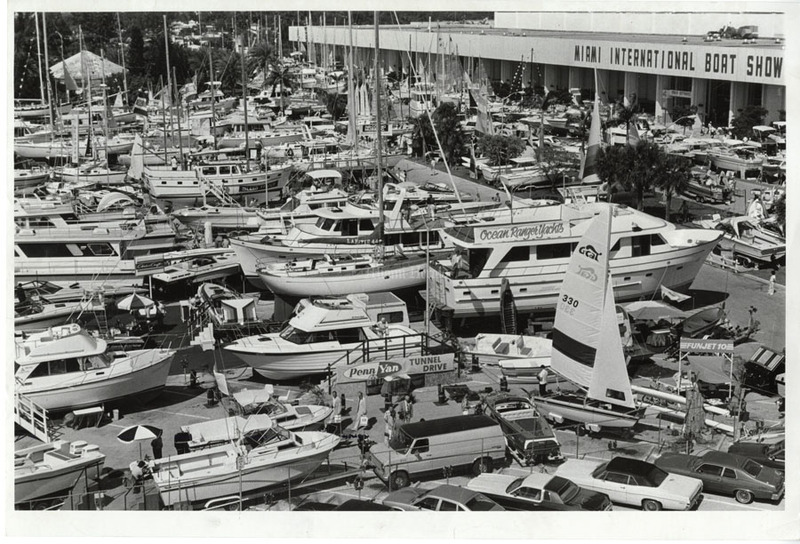 Published 2/24/1980: John Walther/Miami Herald Staff -- Miami International Boat Show at Miami Beach Convention Center. 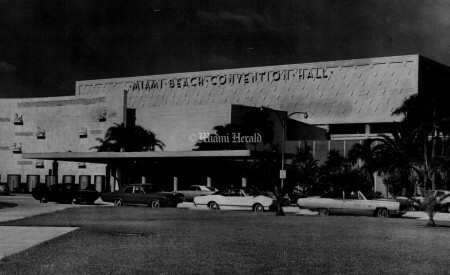 7/1/1968, Bob East/Miami Herald Staff: Miami Beach Convention Hall. 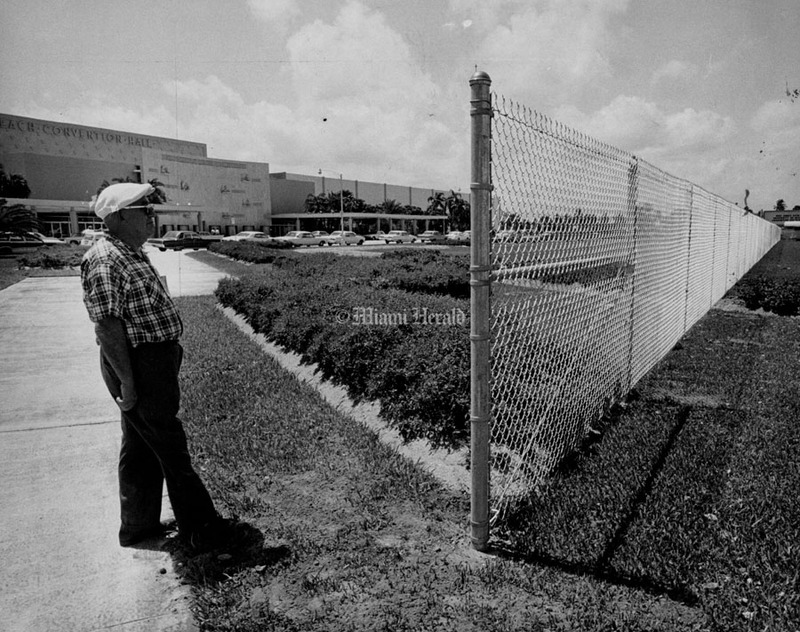 6/5/1968, Joe Schuppe/Miami Herald Staff: Morris Martin inspects fence just erected along Washington avenue. 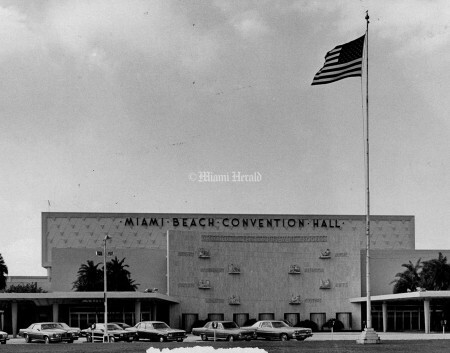 Miami Beach Convention Hall. 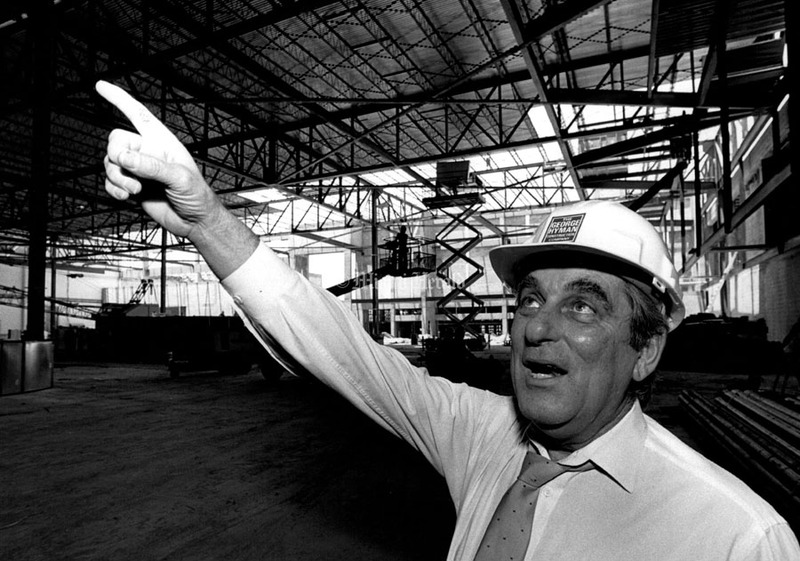 5/11/1988, Randy Bazemore/Miami Herald Staff: Beach Convention Center Manager Norm Litz looks over the construction of the new addition to the convention center. 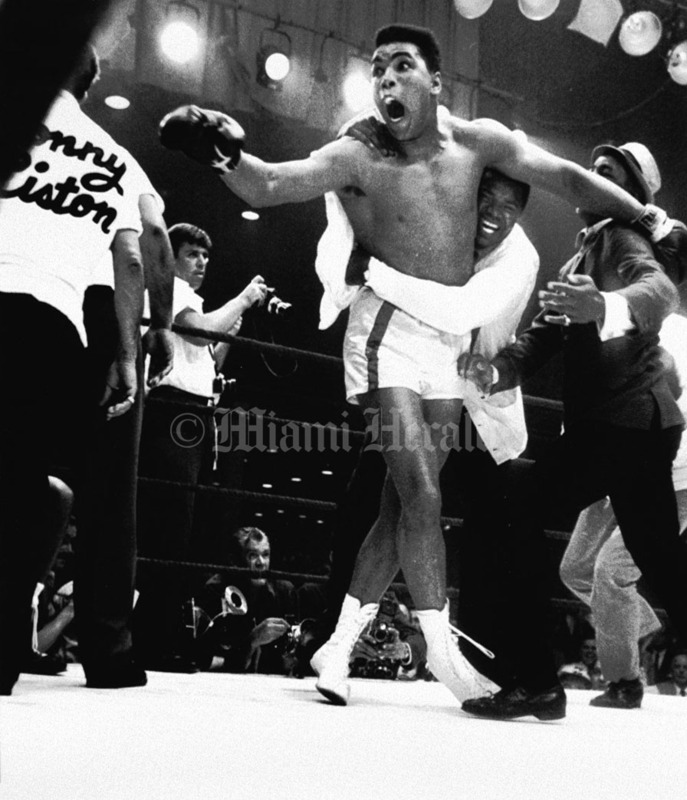 2/25/1964, JOHN PINEDA/Miami Herald Staff -- Muhammad Ali is jubilant after knocking out Sonny Liston in their world heavyweight championship bout at the Miami Beach Convention Hall in 1964. 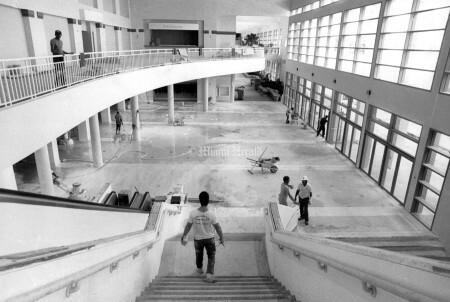 12/22/1988, Chuck Fadely/Miami Herald Staff: Workmen in one of two east entrance lobbies in the new addition to the Miami Beach Convention Center. 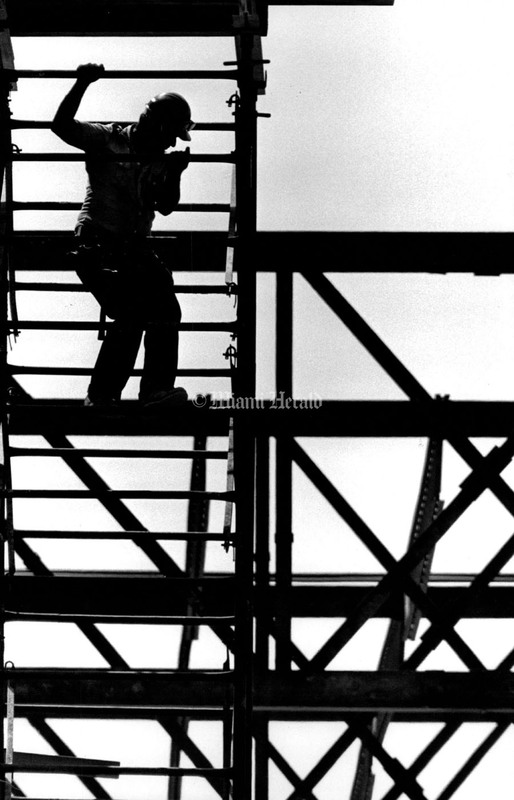 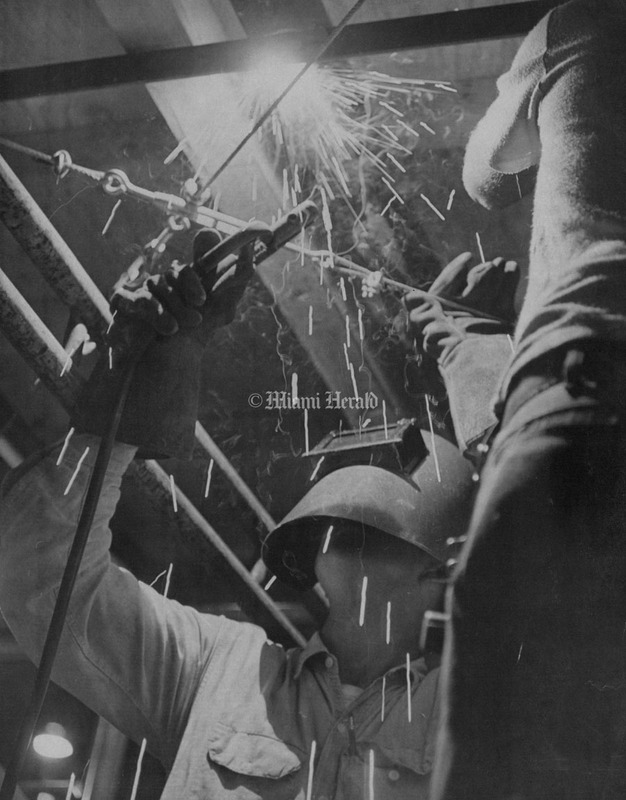 3/9/1988, Randy Bazemore/Miami Herald Staff: High - Stepping- A construction worker climbs some steel girders on the construction expansion of the Miami Beach Convention Center. 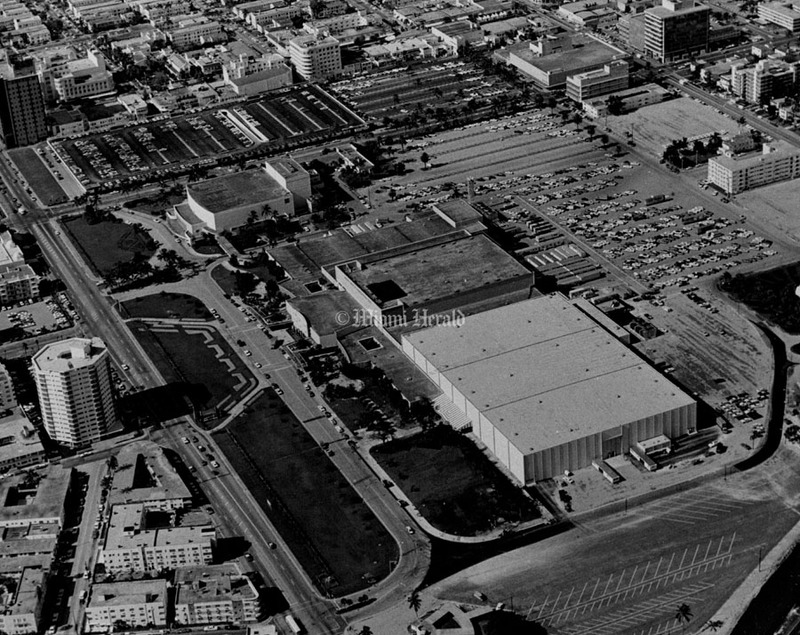 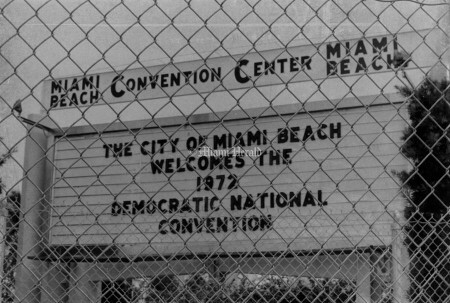 6/29/1971: Democratic National Convention---This is the Miami Beach Convention Hall which will be the site of the 1972 Democratic presidential nominating convention, party officials announced in Washington Tuesday. 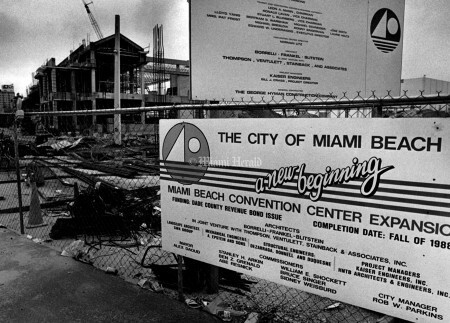 11/19/1987, Randy Bazemore/Miami Herald Staff: Miami Beach Convention Center expansion. 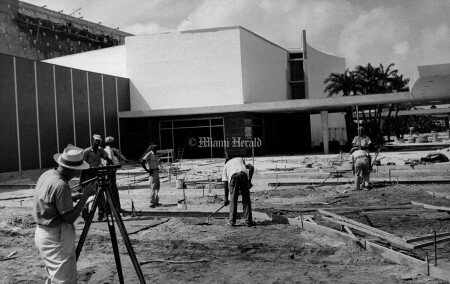 9/16/1958, Bob East/Miami Herald Staff: Scenic walk is being laid at entrance of Miami Beach Exhibition Hall. 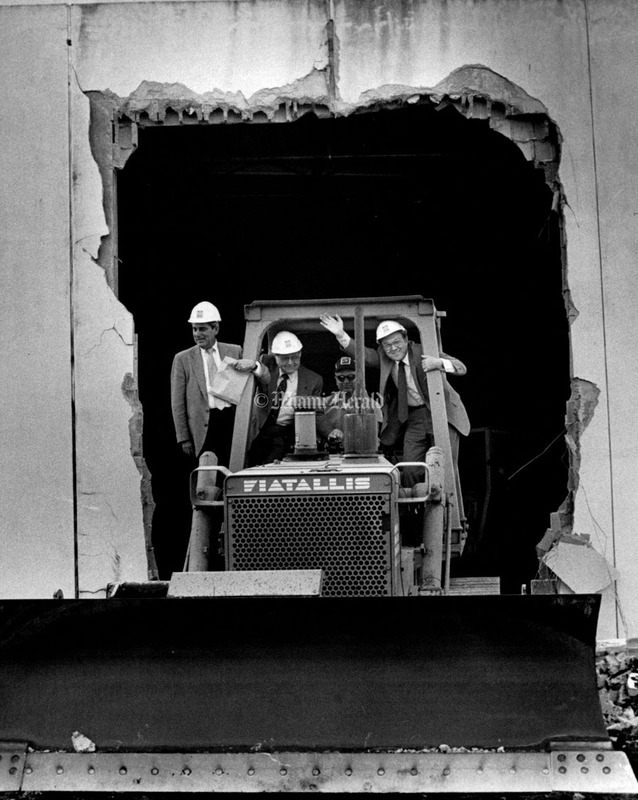 2/26/1987, Albert Coya/Miami Herald Staff: Norman Litz, Convention Center Director, Chairman Leon Manne, driver Florian Hoben and Sidney Weisburd, cross the East wall aboard a bulldozer. 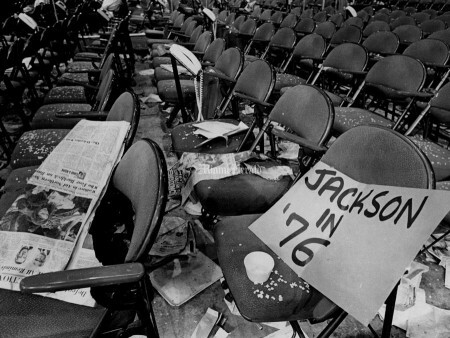 4/1/1968: Before The Parties. 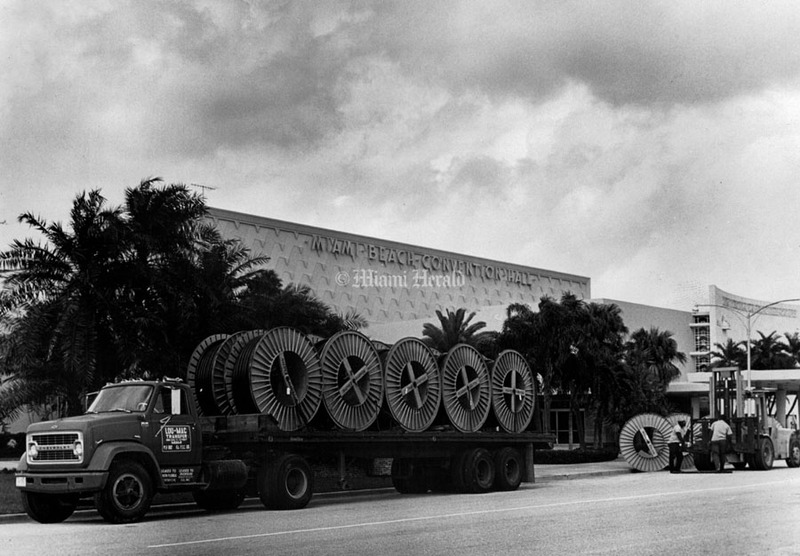 Truckload of Western Electric exchange cable for the Republican convention arrives at Miami Beach Convention Hall. 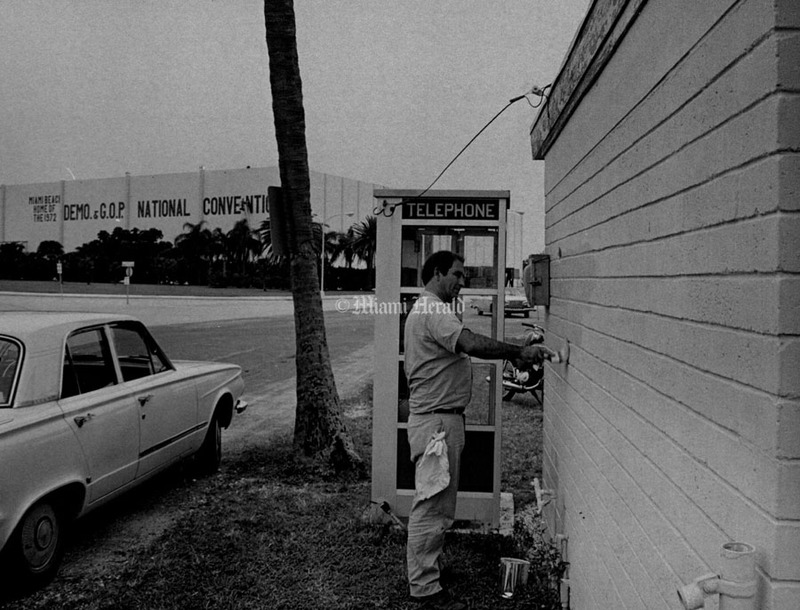 The Bell System is busy now in the quadrennial task of preparing for the Republican and Democratic National Conventions, to be held in Miami Beach and Chicago this August. Public interest in the presidential nominations is intense, and orders for communications service, particularly from news media, are at an all-time high. Western Electric, Bell's manufacturing and supply unit, is already on location, providing engineering support and equipment to the Southern Bell and Illinois Bell telephone companies as well as AT&T's Long Lines Department. 7/1/1968, Bob East/Miami Herald Staff: Miami Beach Auditorium and Convention Hall looking northwest. 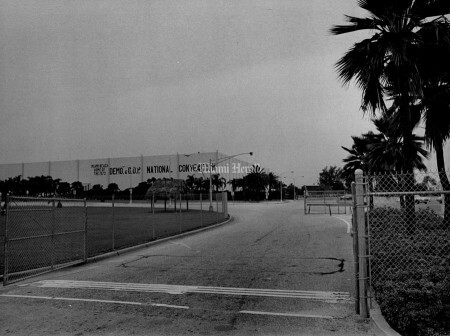 9/16/1958, Bob East/Miami Herald Staff: View from Washington entrance (south) of Miami Beach Exhibition Hall. 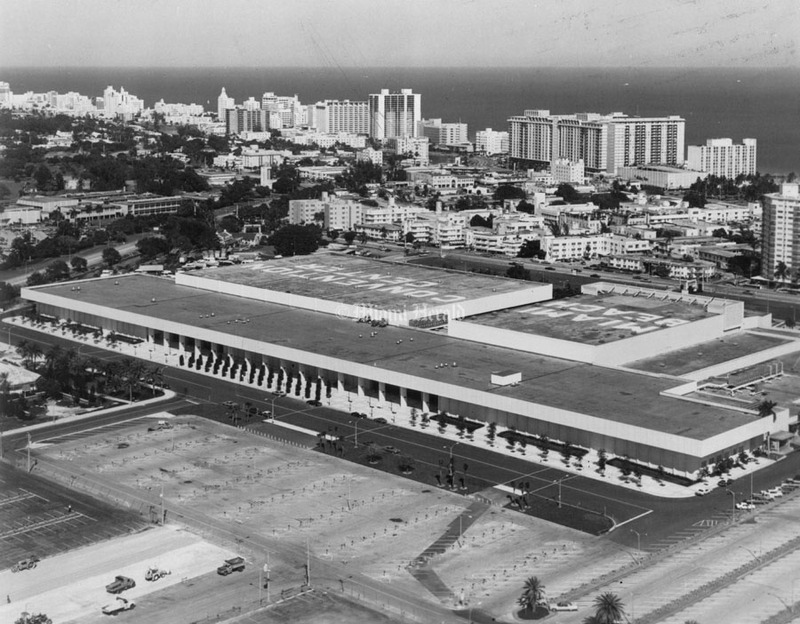 1975: Model of the Miami Beach Convention Hall. 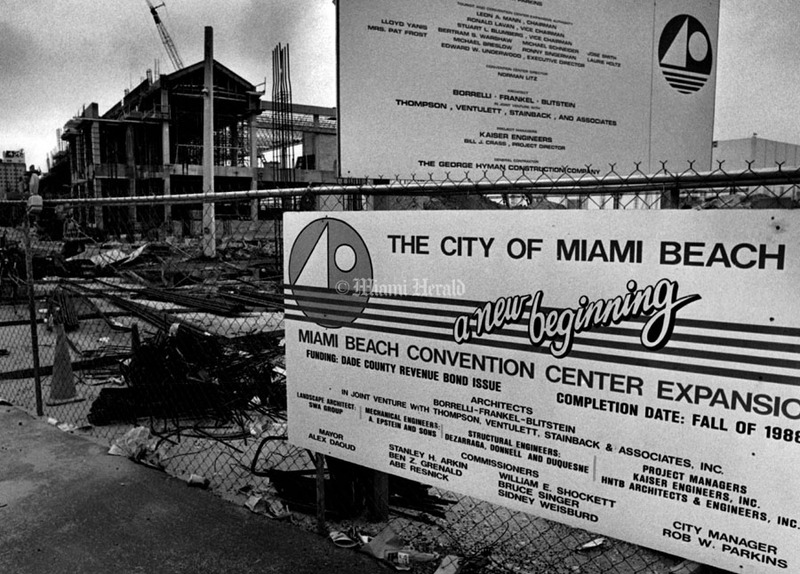 9/13/1983: Miami Beach Convention Hall. 1980: Miami Beach Convention Center from up above. 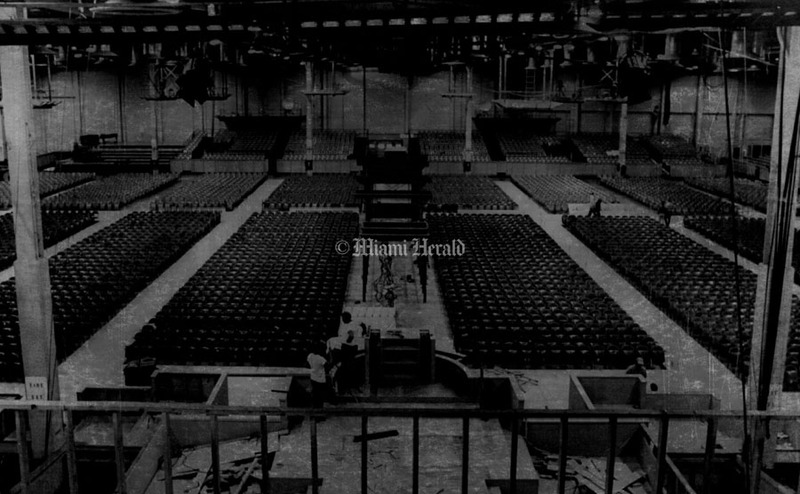 7/7/1972, Bob East/Miami Herald Staff: View of the hall from the speakers stand Miami Beach Convention Hall. 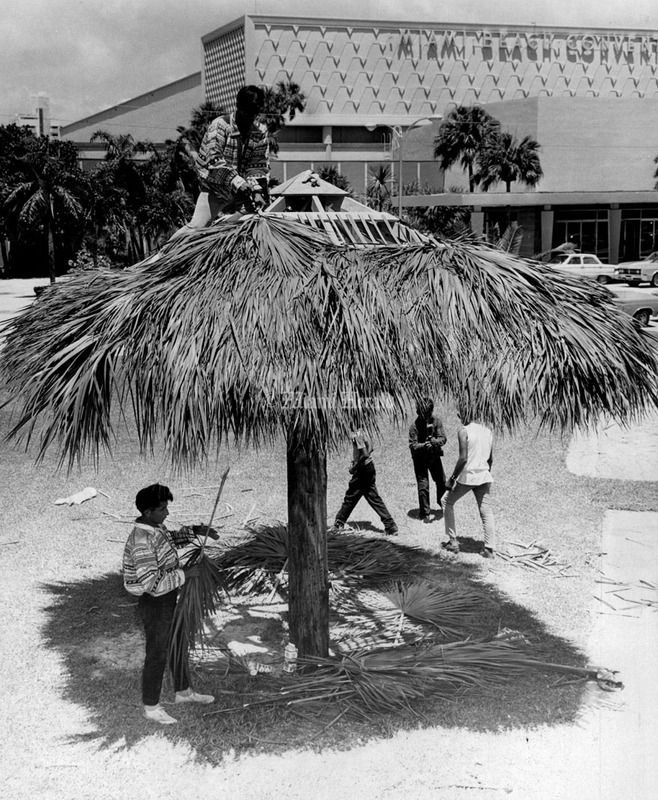 7/27/1968, Bill Sanders/Miami Herald Staff: Roy Cypress Jr. atop "chickee" with father, Roy Cypress, handing up palm fronds to be nailed into place. 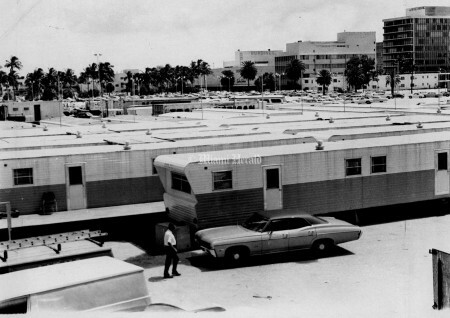 They're in front of Miami Beach Convention Hall. 7/3/1972, John Walther/Miami Herald Staff: Miami Beach Convention Center. 2/12/1976, Roy Bartley/Miami Herald Staff: Miami Beach Convention Hall. 6/2/1972, Bob East/Miami Herald Staff: Check Point Charlie style gates and fences go up around scene of political meetings, complete with secondary barricade fences. 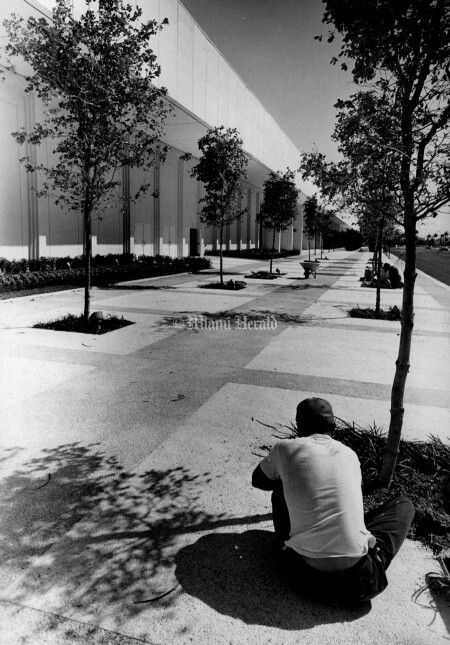 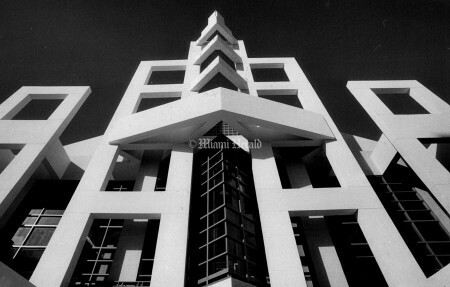 10/11/1974, Marlin Levinson/Miami Herald Staff: Exterior of addition to Miami Beach Convention Hall. 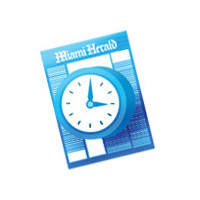 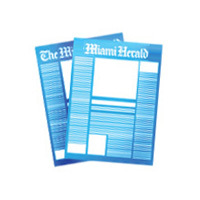 8/28/1968, John Pineda/Miami Herald Staff: Miami Beach Convention Hall expansion opening. 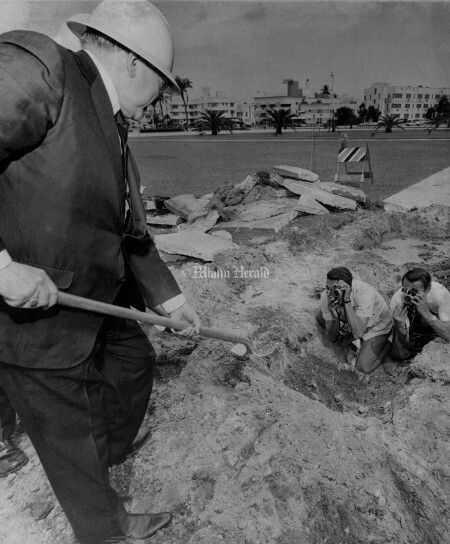 9/23/1967, Bill Sanders/Miami Herald Staff: Searching for the "different" angle on ground breaking photo are Hugo Wessels, U.P.I., and to by massey., A.P. while Ray Bliss, National G.O.P. 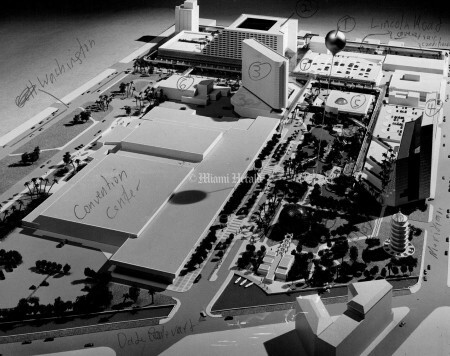 Chairman, breaks ground for new Convention Hall expansion. 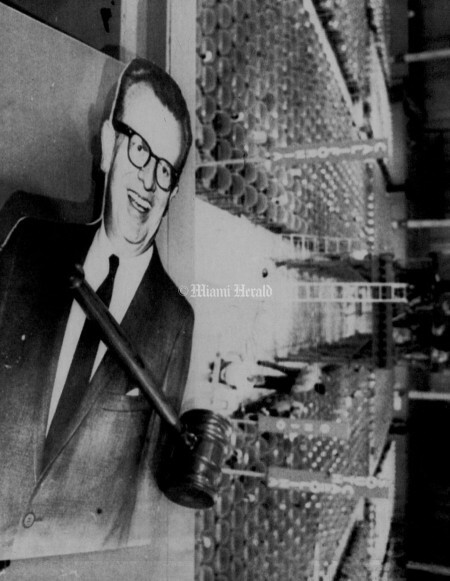 8/2/1968, John Walther/Miami Herald Staff: Acoustic Test at Miami Beach Convention Hall. 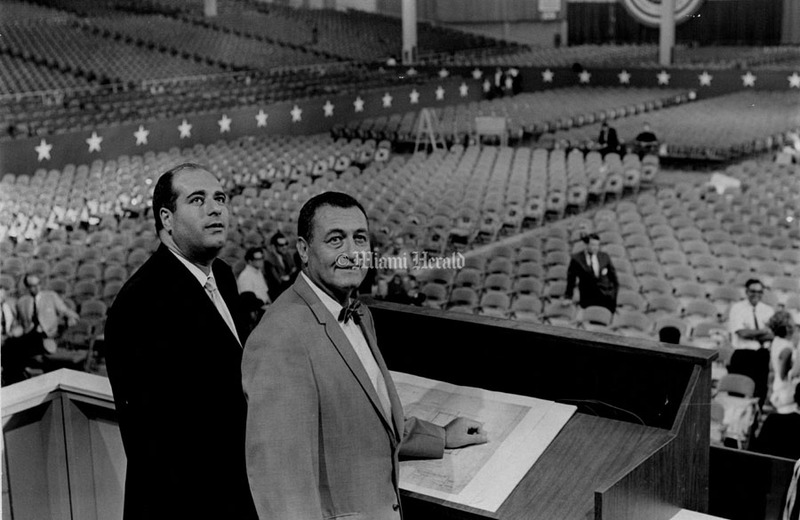 Miami Beach Mayor, Jay Dermer, and hall manager, Duke Ducoff, listen from the podium. 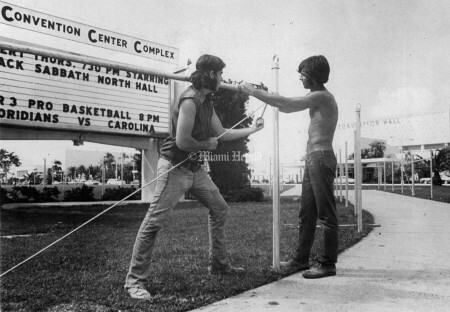 7/1/1968: L to R- Patty Bohannan and Lynn Allen with giant elephant at MB Convention Hall. 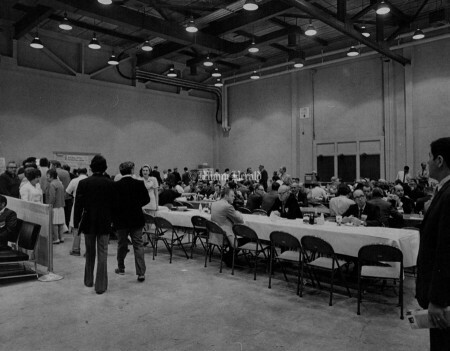 6/16/1972: They're Empty Now, But Wait--This is a portion of the inside of Convention Hall on Miami Beach where the Democrats and Republicans will pick candidates this summer. The 14,860 seats in the hall are empty now, but will be filled in July and August when the parties meet. 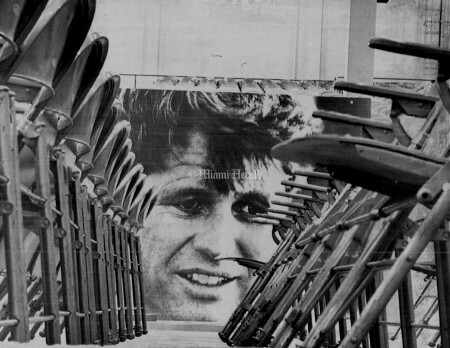 7/6/1972: RFK Photo Mural In Place--A huge photo mural of the late Robert F. Kennedy dominates this scene in the Miami Beach convention hall Thursday as final preparations are made for the Democratic National Convention. 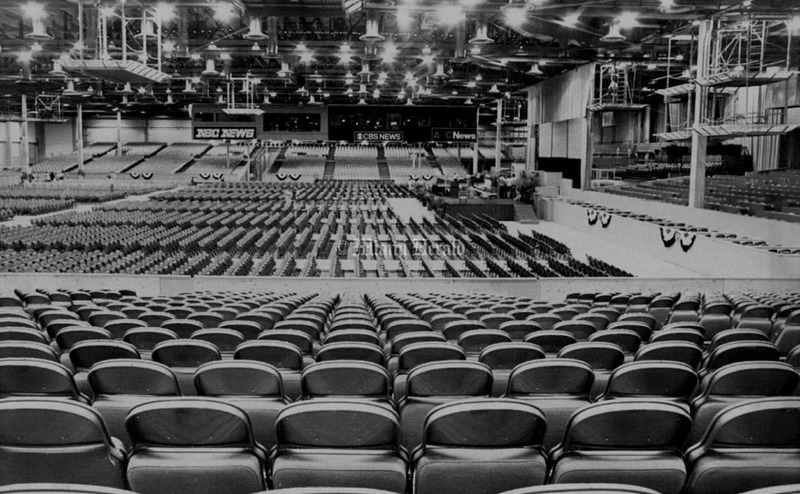 The convention is scheduled to start July 10. 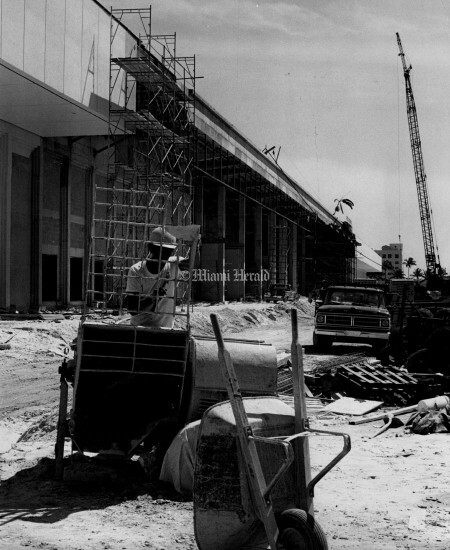 2/23/1968: GOP Convention Site Under Roof--The new addition to the Miami Beach Convention Hall being built to house the 1968 Republican National Convention in August is now under roof. Workmen on the scaffolding in front are applying a cement coating to the exterior walls. 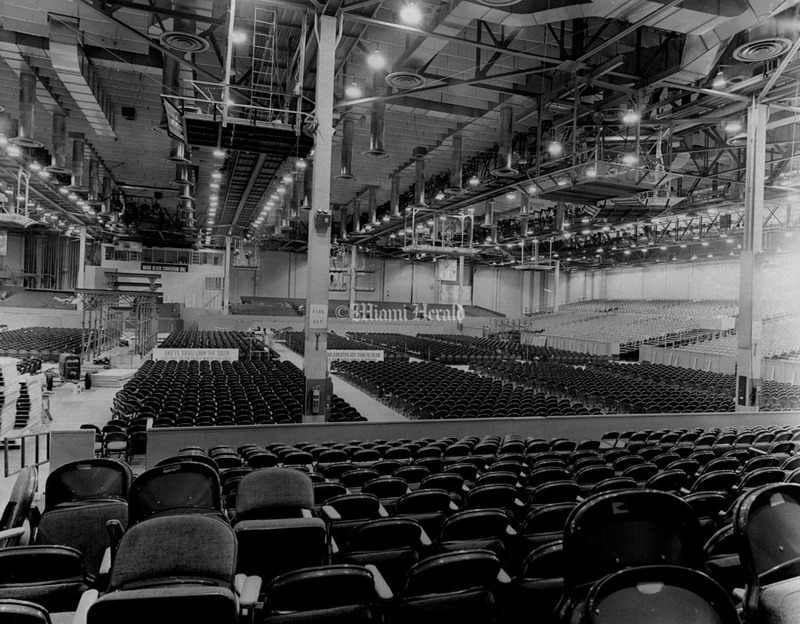 The new building is the high-walled structure in the foreground and is attached to the existing hall at left. 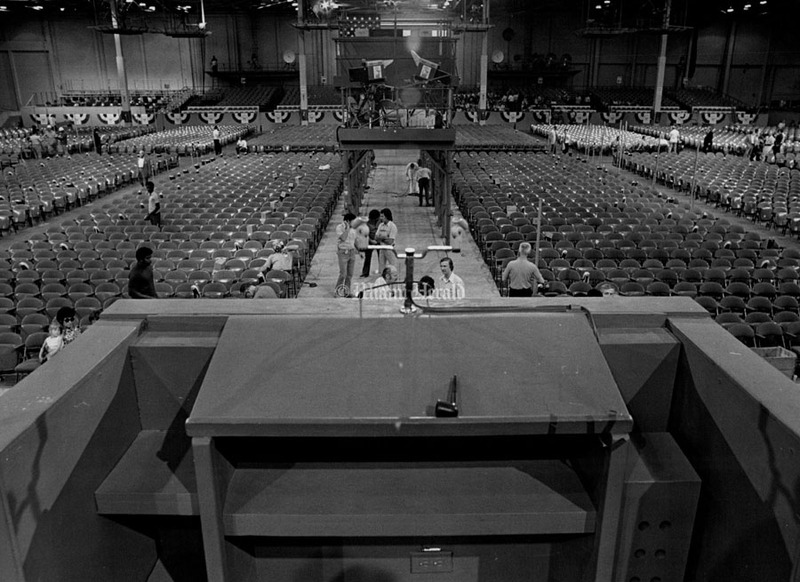 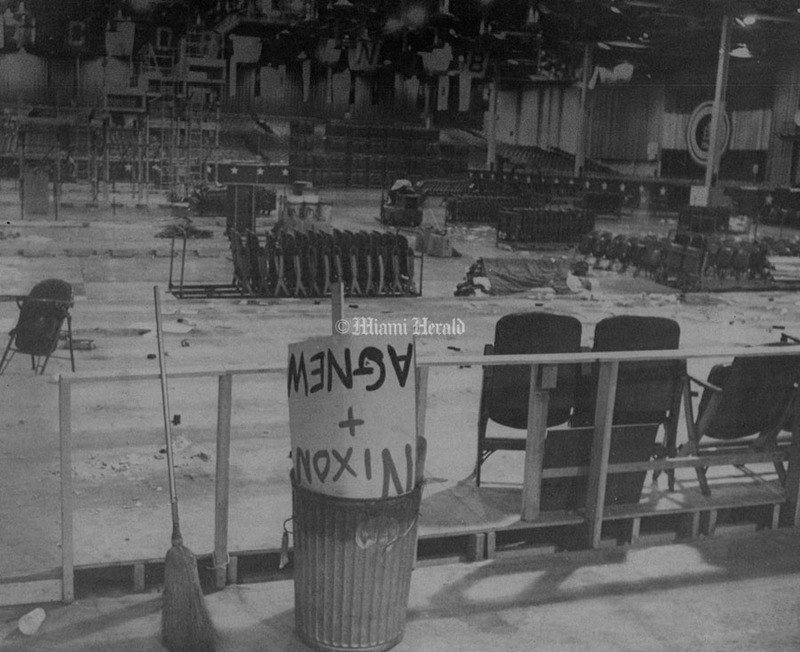 8/9/1968; The Convention is Over---A Nixon-Agnew sign stuffed in a trash can stacks of folding chairs today occupy the space space on the floor where last night thousands of delegates and alternates to the Republican National Convention roared their approval after hearing nominee Richard M. Nixon give his acceptance speech. 8/14/1968, Bill Sanders/Miami Herald Staff: Roar of the crowd is gone, but there are remains. 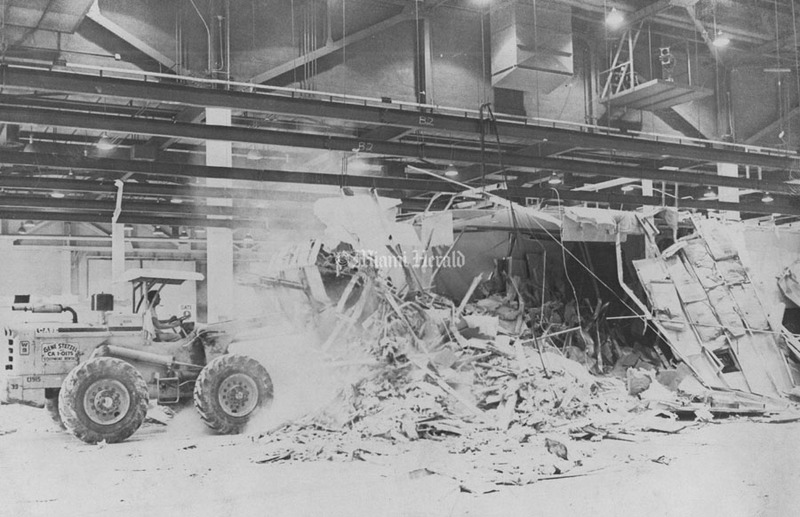 8/14/1968, Bill Sanders/Miami Herald Staff: This is one way to clear a hall. 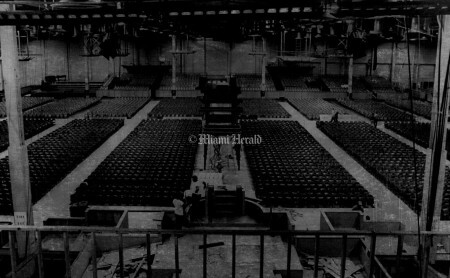 7/24/1968: Work Resumes on GOP Convention Site---Workmen resume construction in Miami Beach Convention Hall this morning, site of next month's GOP convention, after the walkout of electrical workers against CBS ended. 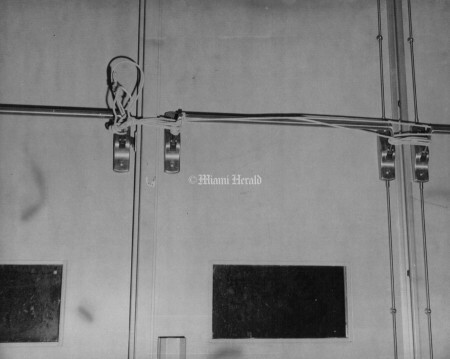 Agreement between CBS and the International Brotherhood of Electrical Workers was reached last night. 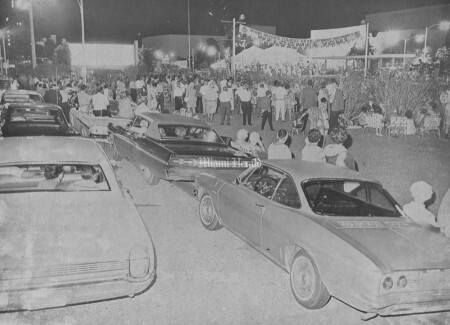 7/16/1968, Miami Herald StaffL Trailer city outside Miami Beach Convention Hall. 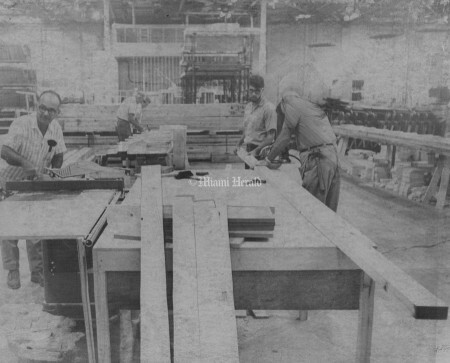 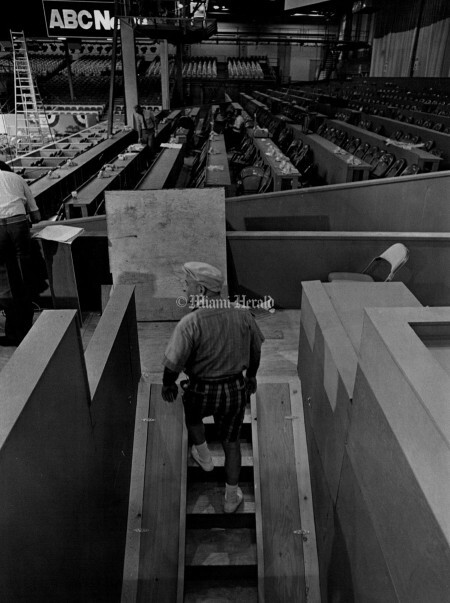 6/28/1972: Democratic Platform---Workmen finish the speaker's platform as they prepared Miami Beach Convention Hall for the Democratic National Convention which opens July 10. 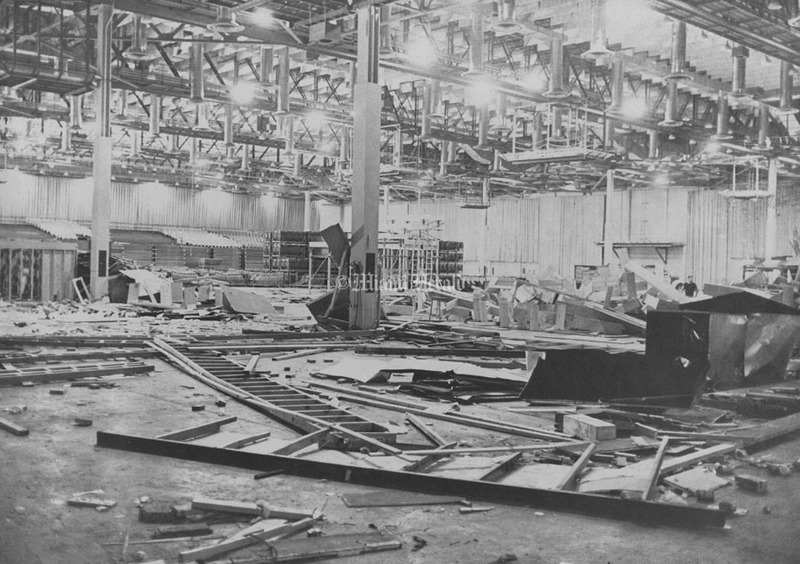 Camera stands are under construction in the center of the hall. 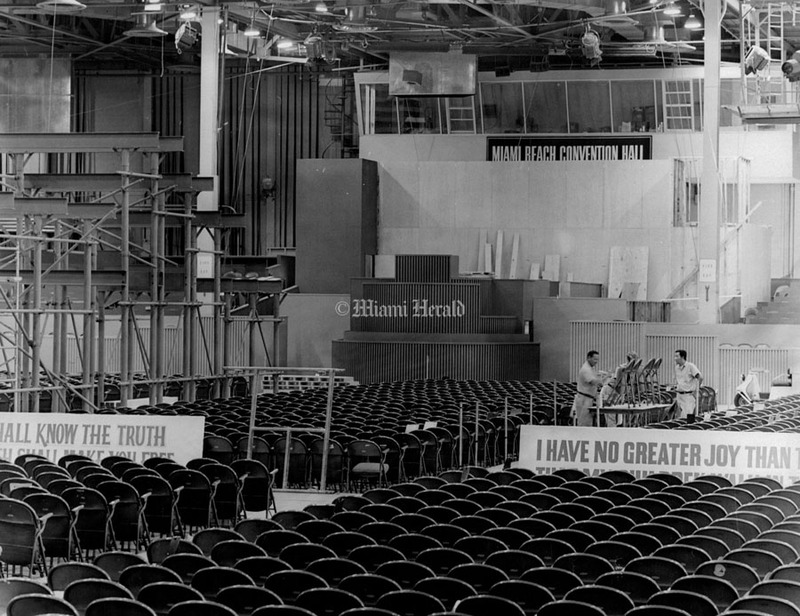 7/15/1972, Marlin Levinson/Miami Herald Staff: Miami Beach Convention Hall after the Democratic Convention. 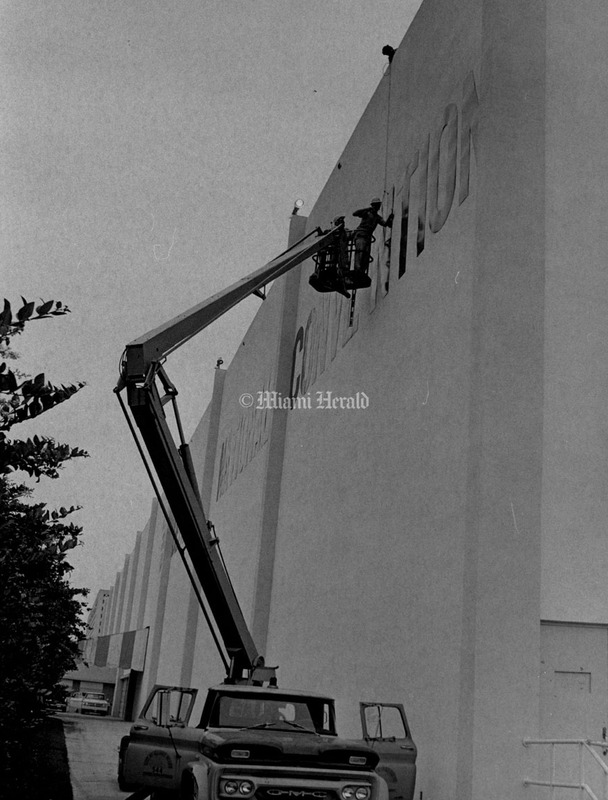 6/2/1972, Bob East/Miami Herald Staff: City of Miami Beach workers rearrange the letters of sign. 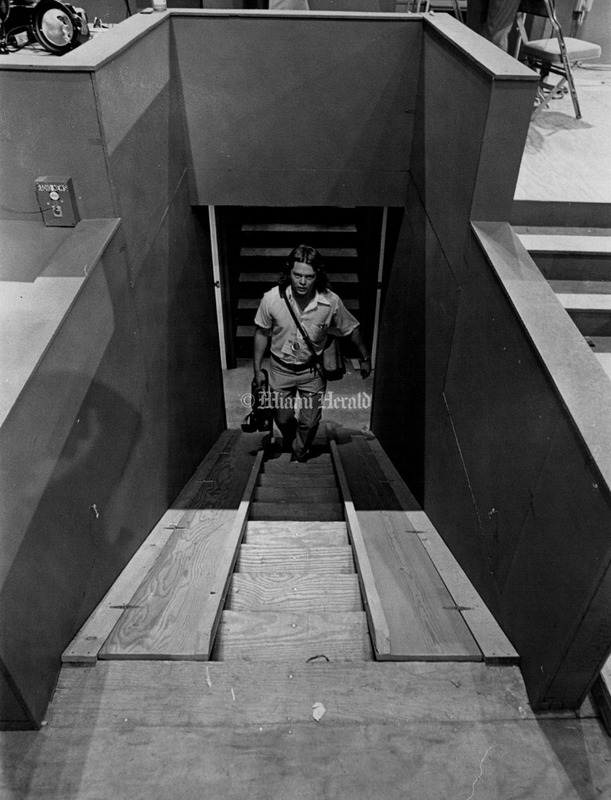 7/7/1972, Bob East/Miami Herald Staff: TV cameraman walks up step steps to speakers platform at Convention hall. 7/24/1968, Bill Sanders/Miami Herald Staff: Back at work at Miami Beach Convention Hall. 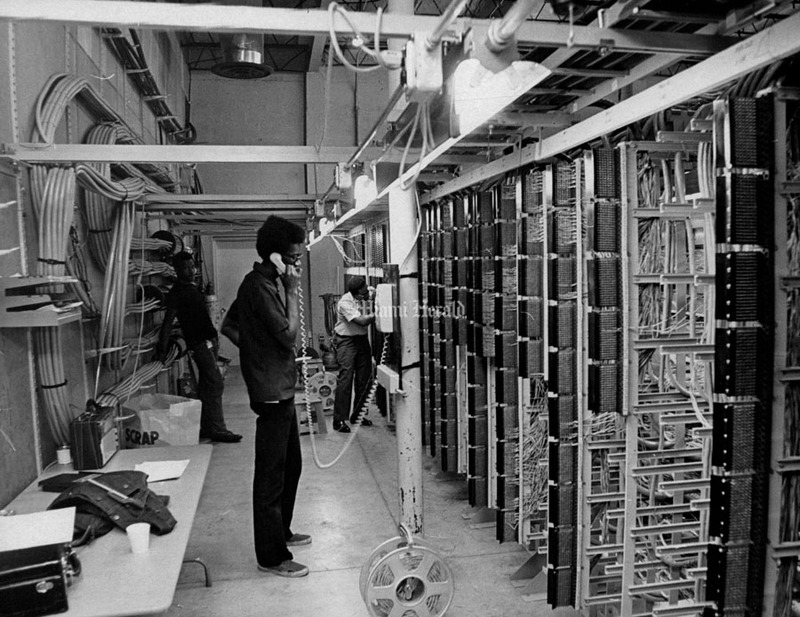 6/2/1972, Bob East/Miami Herald Staff: This is where it all goes out - small portion of telephone company 'frame room where every phone for political conventions goes out to main lines. 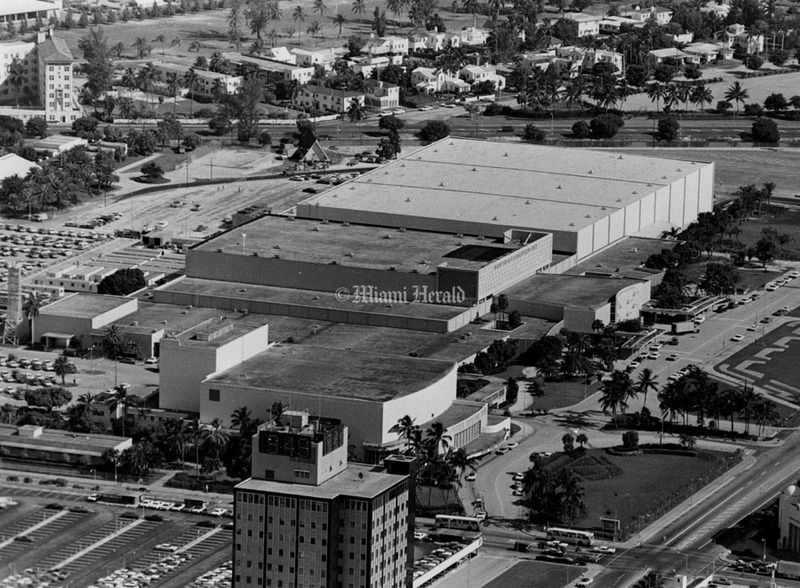 7/7/1972, Bob East/Miami Herald Staff: Miami Beach Convention Hall. Lobby of Convention hall is ready to send out the good word. 3/3/1972, Richard Forgham/Miami Herald Staff: Miami Beach Convention Hall. 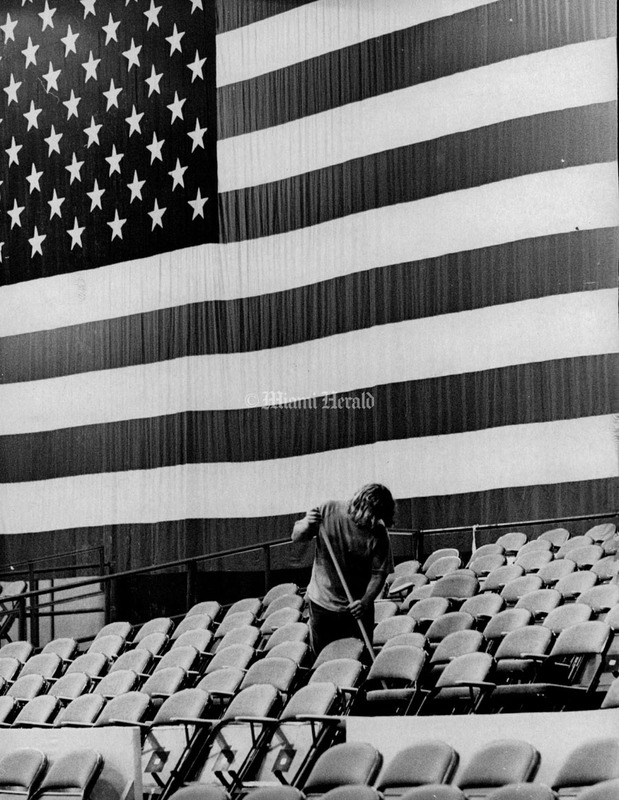 Setting up for Black Sabbath concert. 7/6/1972: Props in Place---A cut-out picture of Lawrence F. O'Brien, chairman of the Democratic National Committee, rests Wednesday with the convention gavel on the podium of the Miami Beach Convention Center as work proceeds for a Monday opening. 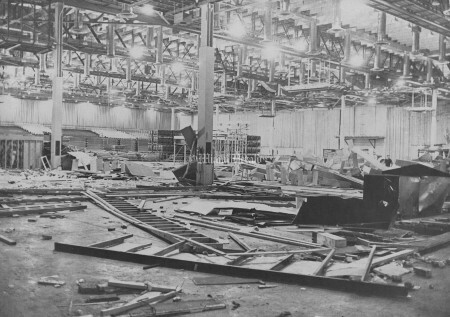 The O'Brien placard was used to aim the television cameras. 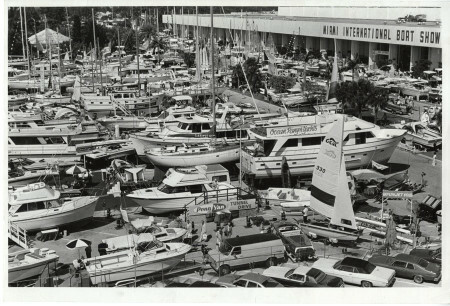 2/14/1985: A view of the Miami Beach Convention Center. 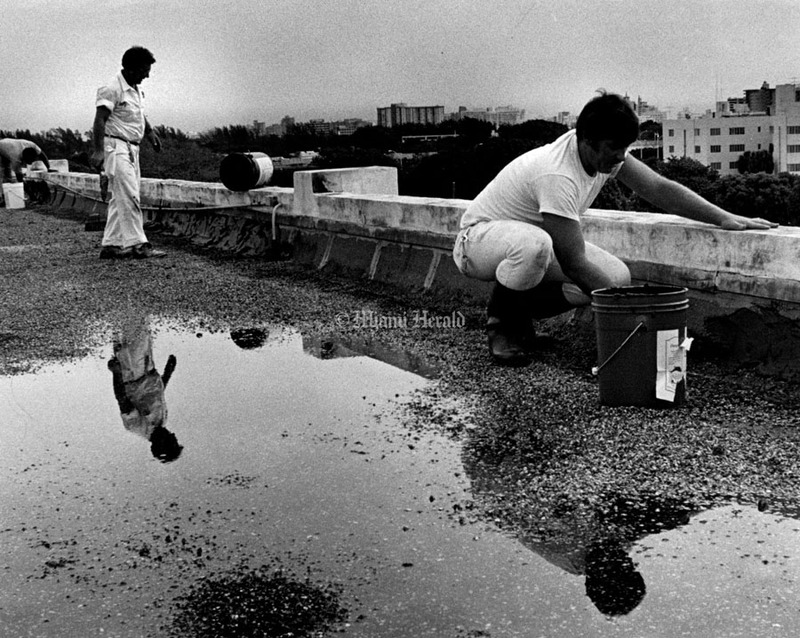 6/2/1983, Albert Coya/Miami Herald Staff: Workers scrambled to repair a leaky roof at a popular home show at the Miami Beach Convention Center that dripped on electrical circuitry, forcing officials to close half the exhibit area. 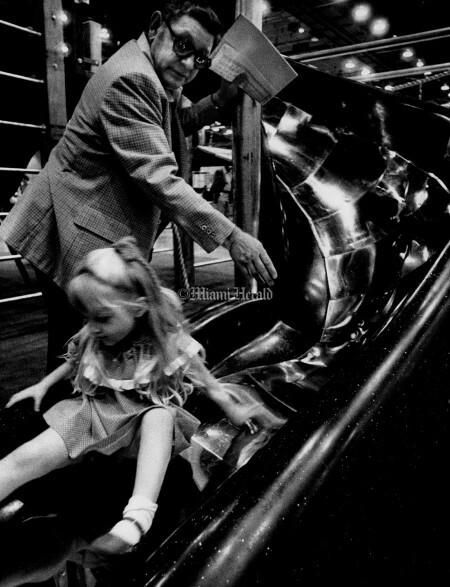 10/18/1978, Joe Rimkus, Jr./Miami Herald Staff: Tiffany Getsch slides past sales man at Parks and Recreation Convention. 4/7/1974: Miami Beach Convention Hall construction. 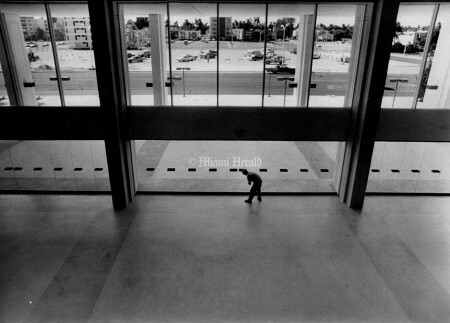 3/6/1980, Trish Robb/Miami Herald Staff: Miami Beach Convention Center. 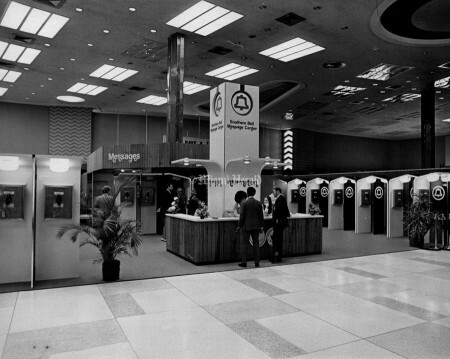 10/11/1974, Marlin Levinson/Miami Herald Staff: Lobby area of the Miami Beach Convention Hall addition. 1/23/1971, Bill Kuenzel/Miami Herald Staff: Miami Beach Convention center cafeteria. 7/7/1972, Bob East/Miami Herald Staff: Visitor climbs steps to speakers platform - bordered by wheelchair ramp. 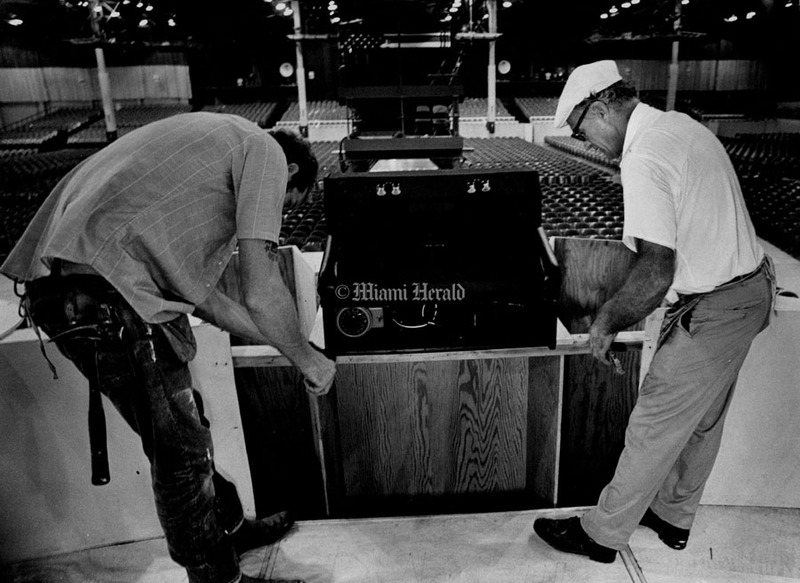 8/13/1972, Marlin Levinson/Miami Herald Staff: Working on presidential podium. Miami Beach Convention Center. 7/15/1972, Ralph Pabst/Miami Herald Staff: Miami Beach Convention hall back to normal after hosting the Democratic National Convention. 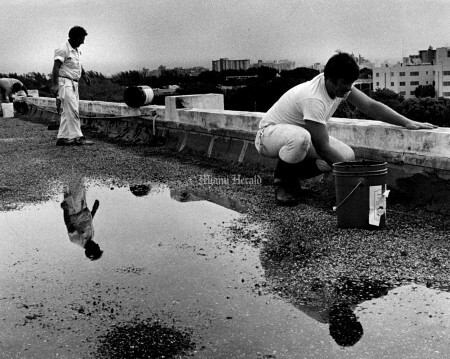 6/2/1972, Bob East/Miami Herald Staff: Even with all the cyclone fence surrounding the property, everything is being spruced up - unidentified city of Miami Beach 'artist' paints old Chess Club building.